This Japanese tofu salad is either the quickest side you can make or the laziest one when you don’t feel like cooking. Either way, you should have it in your recipe repertoire. Hiyakko tofu is a Japanese cold dish consisting of silken tofu topped with a few simple garnishes. The beauty of this dish is found in its simplicity that echoes the culture and cuisine of Japan. Incredibly cooling on a hot, summer day, it feels like a smooth, creamy popsicle on the palate. Highlight the clean flavors by using the highest quality ingredients possible such as an organic tofu and premium soy sauce. It can be eaten as a salad on its own or shared as an appetizer. The regular and reliable Kikkoman soy sauce works for many dishes, but this salad may be worth investing in a premium soy sauce. 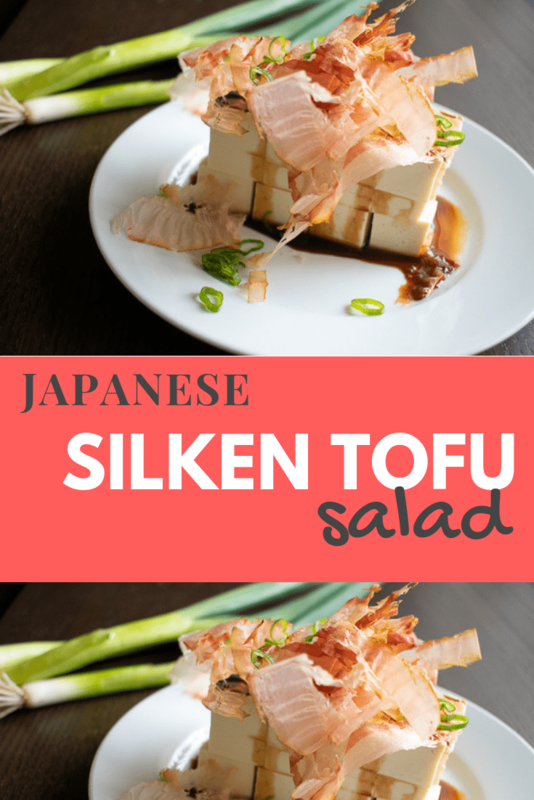 Much like you would use the finest extra virgin olive oil to drizzle on salad so would you use this soy sauce to enjoy with sashimi or to season a raw salad such as this Japanese tofu salad. Shoyu is the Japanese version of soy sauce. This organic yugeta shoyu is brewed in Saitama, Japan from organic soybeans and wheat. Aged in cedar vats, it has a noticeably bright, clean, and richer flavor than most regular soy sauces. Try out this or another special soy sauce to season your tofu and add some complexity to an otherwise simple salad. Bacon bits? It’s not so traditional, but it certainly doesn’t sound like a bad idea. The silken, also called soft, tofu will continue to leech water as it sits. Cut and plate the tofu just prior to serving. Slice the green onions as thinly as possible. It will look nicer and match the delicacy of the tofu. Incredibly cooling and quick to make, this salad feels like a smooth, creamy popsicle on the palate. Carefully remove the block of soft tofu from packaging without breaking. Cut into bite sized cubes and transfer to serving plate. Dress with soy sauce and sesame oil. Garnish with bonito flakes and green onion.